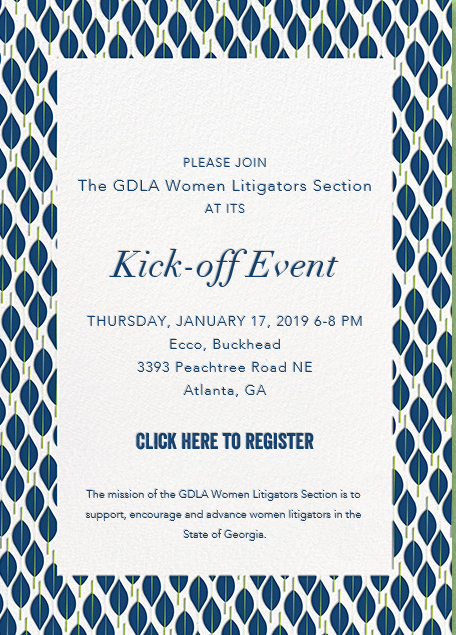 We are pleased to announce the establishment of the GDLA Women Litigators Section whose mission is to support, encourage and advance women litigators in the State of Georgia. We invite all those interested to join the Section. To do so, log into the members only area of our website, click My Profile, and scroll down to Practice Areas – that’s where we’re housing the checkbox for now. Under the leadership of Chair Karen Karabinos and Vice Chair Alycen Moss, as well as those listed below, the Section will hold educational programs and networking events, participate in philanthropic endeavors, and more. GDLA members, you will be redirected to the login page. If the event has a registration fee, registrants will have the opportunity to print/mail the registration form with a check, or pay by credit card (includes administrative processing fee) on the confirmation page.